It was winter and the young princess was looking out of the window, where snow, as white as her skin, was falling quietly outside. She loved winter and snow for it reminded her of her mother, who had given her the name Snow White, because of the girl’s fair skin. 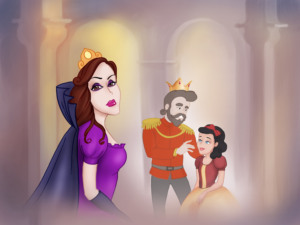 Snow White was growing happily at the castle with her father - the king and her step-mother - the beautiful queen. Her father was a good and caring man, but her stepmother was a proud and vicious woman. 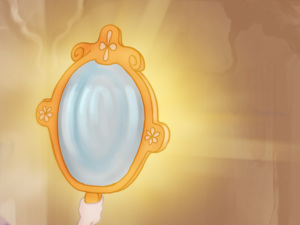 The mirror was not only magical, but it was also very honest and it would always tell the truth. And the queen loved hearing that she was the most beautiful in the world. But Snow White grew and her beauty blossomed. 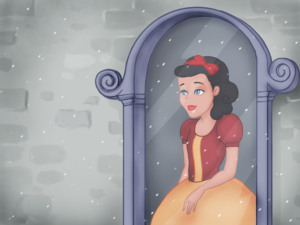 One day when the queen asked her mirror who was the fairest of them all, she received an unexpected and very unwanted answer: "Snow white , my queen, is the most beautiful among them all." The news struck the queen but after the initial shock, she decided to solve the problem. Her plan was as cruel as her heart. 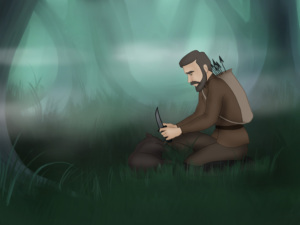 The vicious woman called her guard and ordered him to take the girl to the woods, kill her and take the heart back to her as a proof. 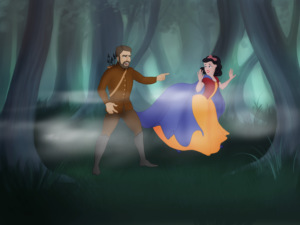 The guard took Snow White to the woods following the Queen’s orders. He was a brave warrior and an honest man, but he was not cruel. When they went far enough, the guard told her to run away. His good heart just didn’t let him kill Snow White. 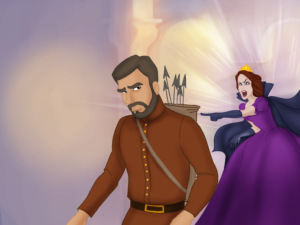 On his way to the castle the guard, killed a wild pig and took its heart to show to the queen. 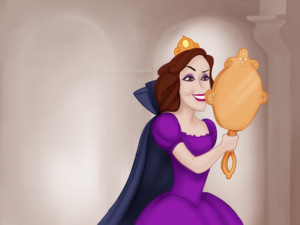 Happy to hear that Snow White was dead, she hurried to her mirror and asked: Mirror, mirror, on the wall, who’s the fairest of them all? "Snow white, my queen, is the loveliest among them all. 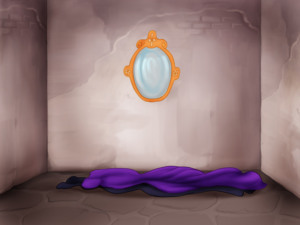 Saying that, the mirror showed to her majesty that the girl was still alive." 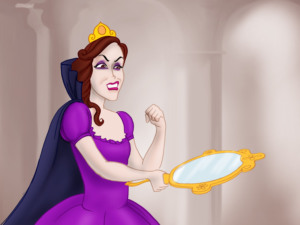 That Snow White’s stepmother was vain and vicious was well known. 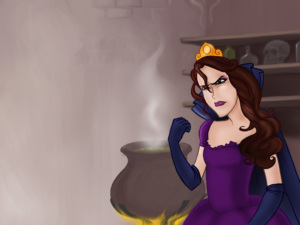 However, no one knew that the queen was capable of certain magic, too. 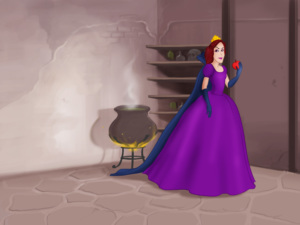 So when she heard the news, she waited no more but decided to kill Snow White on her own. 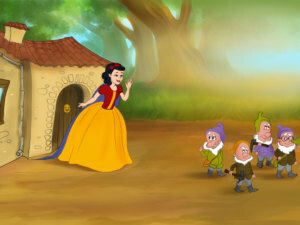 At the time Snow White wandered alone in the woods, until she came to a small cottage. It looked so unreal with its tiny windows and small door and chimney. 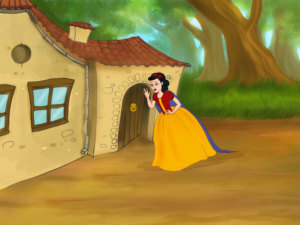 “I wonder who lives there”, Snow White said to herself and entered the house. Inside everything was just as small as the house itself. 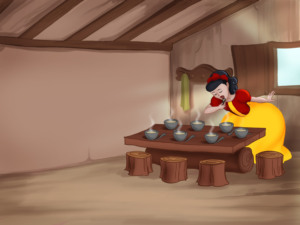 The table was set for seven people and Snow White was hungry. Therefore she decided to have a bite of each meal and a sip of each cup, so that she didn’t leave anyone without a meal. 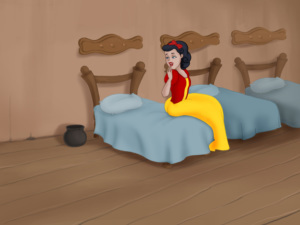 When she was done eating, Snow White went to the bedroom and tried a couple of beds before she fell asleep on one of them. It was not long before the house owners got home. They were seven dwarves, who worked in the mines every day. What a surprise it was for them to find that someone entered their house and was now sleeping on one of the beds. The dwarves let her sleep. 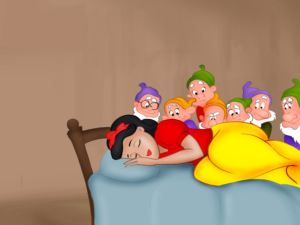 When she woke up, Snow White told them her story. When they heard all that she had to tell the dwarves gathered for a meeting. They decided to let her stay and live with them. 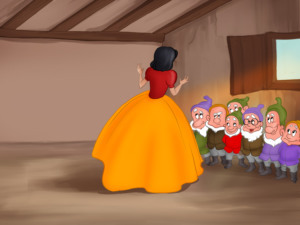 The next day they left to work and warned Snow White to be very careful and not to open the door to strangers. At that time the queen had been preparing the next evil plan to kill Snow White. 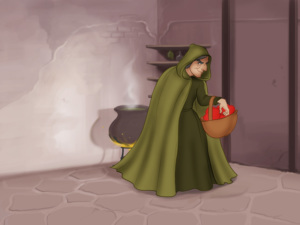 She dressed herself as an old woman, took a poisonous apple, which she had prepared herself and set off to find Snow White. “Sweet apples I have milady! Won’t you buy some?”, the queen asked Snow White when she found the dwarves’ cottage. “My landlords, told me not to open the door to strangers”, the girl said. “Oh, you needn't open the door. 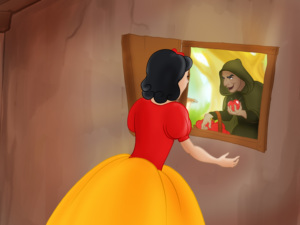 Here, try this big red apple”, the queen said and gave Snow White the apple. 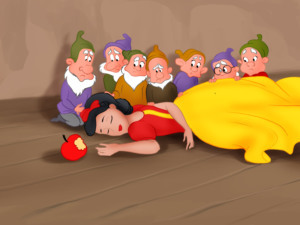 When Snow White bit the apple, she fainted on the floor lifeless and the queen ran away. When the dwarves found her, they thought she was dead. They tried everything they could to save her, but they couldn’t bring her back to life. The dwarves cried and wept for days. They laid her on a bed of rose petals in a crystal coffin and started to the mountains to leave the coffin there, so that they could see her beautiful face every day when they were going to and back from the mines. 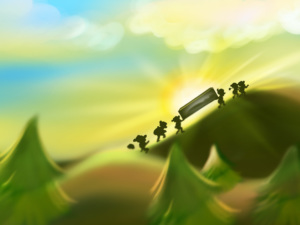 On their way to the mountains a stranger met them. He was riding a beautiful black horse and when he saw Snow White, he fell in love with her. 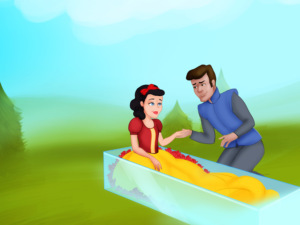 “Where are you going with this beauty”, he asked them and they told him that they were going to the mountains to lay the coffin there so that they could go and visit Snow White every day. Then the stranger, who was a prince suggested, “Let me help you with this! 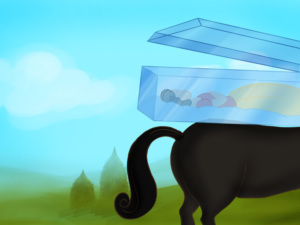 You can put the coffin on the horse’s back.” The dwarves lifted the bed of roses and all started for the mountains. 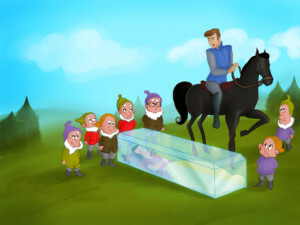 On their way the horse stumbled over a bump and at that moment Snow White coughed out the poisoned bite. When she woke up the prince and the dwarves couldn’t express their happiness. She told them what had happened and they understood it was not an old woman, but the vicious queen herself, who gave her the apple. The stranger then spoke, “My princess, if you become my wife, I will protect you day and night from your stepmother”. 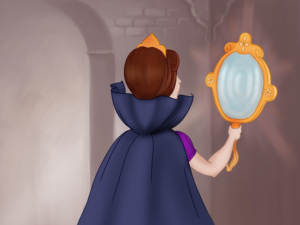 At that time the Queen was standing in front of her magical mirror. 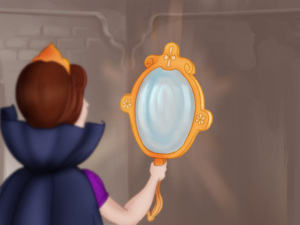 “Mirror, mirror, on the wall, who’s the fairest of them all?”, she said thinking that the mirror would give her the answer she was expecting. “Snow white, my queen, is still the fairest of them all. She survived your poison and she is getting married to a prince who saved her.” The queen couldn’t bear the news and died.